How to handle Domestic Waste? A seminar on “How to handle Domestic Waste?” was held on Sunday 10th June, 2018 at 4.30 pm in TMAM Research and Orientation Centre Auditorium. 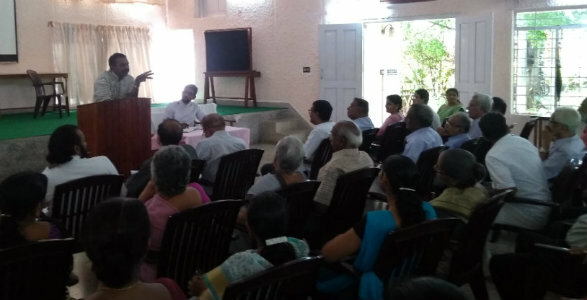 Mr. Christopher M, Chief Coordinator, Waste Management, Pathanamthitta District conducted the seminar. For the general population Waste is something that has become useless and needs to be discarded. Wastes need to be discarded in a way that is beneficial and not hazardous to living things and the environment. Everything we think of as Waste is not actually so. In a broader sense, anything that is biodegradable, or recyclable is not Waste. Things we discard can be classified as biodegradable and non-biodegradable. Biodegradable materials are composed of waste from living organisms and is decomposed by microorganisms like bacteria and fungi. e.g. Human and animal waste, Wood, Paper, food waste, Leaves etc. Take a large earthen or plastic container with a hole at the bottom. Or it can be a small pit with two rings kept one on top of the other. Line the bottom with a layer of soil or untreated sawdust. Start adding food waste preferably once a day. Cover it with sawdust, straw or dry leaves. Cover it with a plastic sheet to keep away direct sunlight and rain. The liquid draining out from the container can be collected and used as an insecticide after diluting. This liquid can also be used as a toilet cleaner in place of the commercially available toilet cleaners which kill the bacteria that act as decomposers. Add a teaspoon of inoculum once a week for faster composting. Avoid pouring liquid waste into the compost bin. Compost can be collected every three months. Equal quantity of compost and sand can be used in growbags for growing vegetables. Non-biodegradable objects cannot be decomposed into organic substances. e.g. Metals, glass, plastic, electronic devices, medical and sanitary waste. These should be segregated and sent to the recycling plants. Plastic is almost always thought negatively. If an auditorium is to be filled with wooden chairs imagine the number of trees that need to be cut. Is this beneficial to the environment? Is it not better to use plastic chairs instead of wooden ones? Plastic is a wonderful invention and its use can never be avoided altogether. Moreover, these plastics are recyclable and cannot be considered Waste. However, plastic disposables like paper plates, paper cups, straws and carry bags cannot be recycled and must be completely avoided. Plastics should never be burnt, and it never will be decomposed. So, these remain in the environment and can only be discarded as landfill. E-waste includes discarded electrical and electronic devices and its parts and should be disposed for recycling or carefully discarded as landfill in secluded places where it can by no means get mixed with water resources. The only way to dispose Sanitary Wastes is to have it burnt. There are government initiatives for Waste disposal and Management. The Haritha Kerala Mission aims to make local bodies or wards capable of waste management and has government funding for waste procurement and management. But how far they cater to the needs of the people is a big question. They need to be pressurised for our go green mission. Effective Waste Management helps protect the environment and maintain health of the population. This can be flawed by thoughtless waste disposal. We are responsible for keeping our environment safe and healthy for us and our future generations. A memorandum requesting the collection of non-degradable waste will be submitted to the Vijayapuram Panchayat, Puthupally Panchayat and the Kottayam Municipality. The memorandum is to be drafted by Mr. Kurian and Mr. Sajeev. Brijesh to coordinate waste collection in TMAM or Community Centre after checking with the Centre representatives. A time slot is to be set for the Waste Collection say every 1st Saturday 4.30 to 5.00pm. The waste collected will be sent to Mr. Christopher’s “Unwanted is Wanted” collection site. The directions on segregation of wastes to be drafted by John Philip Achen. There will be a following up meeting on July 1,2018 from 5pm to 6pm. A follow-up class to be set up with Mr. Christopher after 6 months.